It is copyright © James Byrne and Jacket magazine 2009. See our [»»] Copyright notice. the year we dartled above its casket. for months a secret necklace. beau monde grande dame coquette. deluxe: the kind that demands attention. her face fully-trained, tanned as a violin. and a wedding stone in my right hand. until punished by the logic of the Gods. we cross at Ahcanul from the gulf port. autopsied the on-dead during caste war. seven years quarantined to a muzzy drunk. to the sun priest of Coba: Come is the quetzal. crackles in heat like the skin of a cochinita. on the floor of the sea. How cruel life is! his life had been hanging by its tail. a good heap of soil and faithful lament. with a bullet that stuck at tremendous speed. What an end: a hole through the pump! just the radio instinct of sirens wailing. Snitchers? Any card from the pack. in the system. There is no green ending. with a nastiness that grows on from itself. 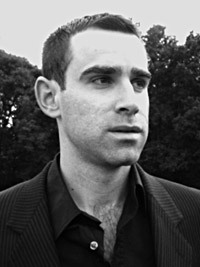 James Byrne was born near London in 1977. He is the editor and co-founder of The Wolf poetry magazine. His second collection, Blood/Sugar, will be published by Arc Publications in November 2009. He has translated the Yemeni national anthem and is currently working on versions of contemporary Burmese poets. In 2008, he won Treci Trg poetry festival prize in Serbia. In 2009 his New and Selected Poems: The Vanishing House was published by Treci Trg (in a bilingual edition) in Belgrade. He is the co-editor of Voice Recognition: 21 Poets for the 21st Century, published by Bloodaxe in September 2009, and is co-editing the Collected Poems of Hope Mirrlees (Carcanet 2011).